Happy Halloween! 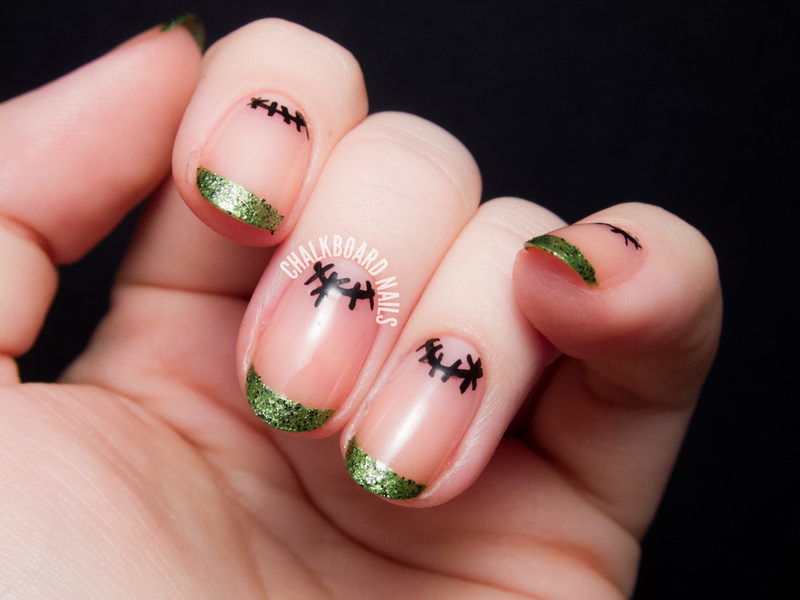 I was still rocking my flannel nail art yesterday, and was going to leave it on today, but I couldn't let the holiday pass without doing some festive nail art. I did this quick manicure last night, and love the simplicity! It's like a deconstructed Frankenstein's monster, and took maybe 10 minutes to do each hand. I began by applying base coat to protect my nails. Then I used French tip Nail Vinyls to block off my tips, and painted on two coats of China Glaze But of Corpse. Then, I used a small nail art brush and black polish to paint on the stitched moons. I finished the look with topcoat because I had to seal in the stitched art, but it's worth mentioning that But of Corpse dries with a really gorgeous matte finish. The black glitter almost gives it a textured effect! I'm also wearing a fun spiderweb cat-eye look today, which you can see on my Instagram! I love Halloween! Love the simplicity to these! cute idea, really like them! I really want to try the chalkboard nails!